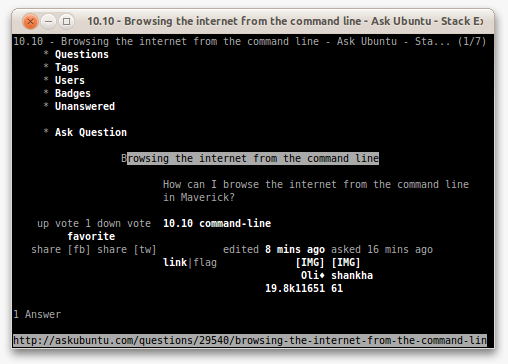 How can I browse the Internet from the command line in Ubuntu? Toggle link numbering - . 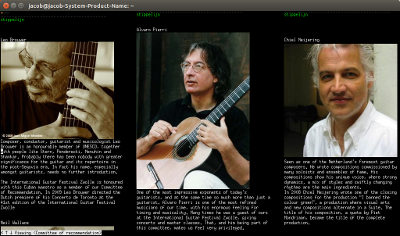 Wikipedia has a List of more text-based web-browsers, not all of which are available in Ubuntu. To my surprise it exists; I installed it and it works! If you use for example XTerm (not Gnome Terminal), W3M is even capable of showing images! 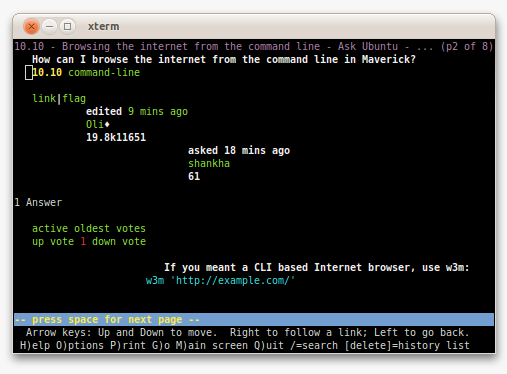 For more information see “How to Browse From the Linux Terminal With W3M”. 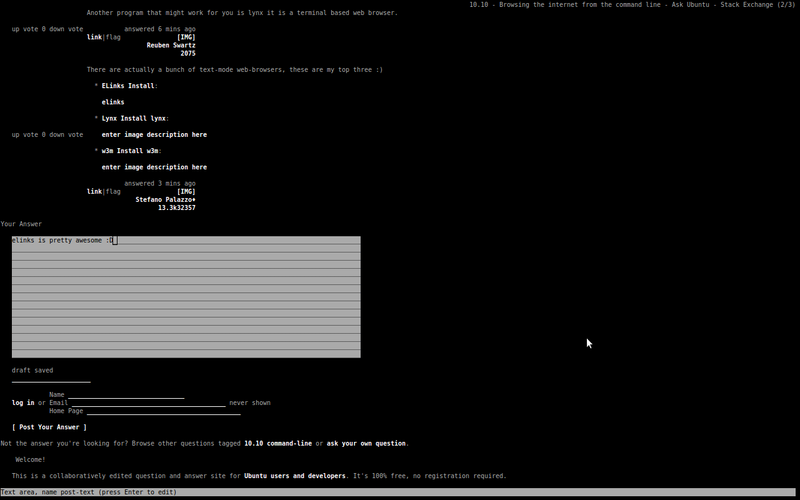 links2 -g is a strange terminal-embedded graphical-mode browser. It's fast but hates modernity. 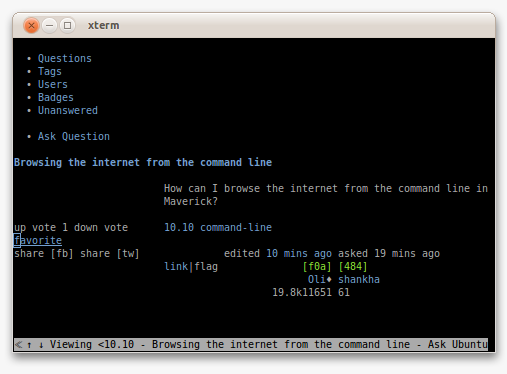 If you like to search from the command line, try surfraw . elinks : "an advanced and well-established feature-rich text mode web (HTTP/FTP/..) browser. ELinks can render both frames and tables, is highly customizable and can be extended via Lua or Guile scripts. It is quite portable and runs on a variety of platforms"
retawk : "an interactive, multi-threaded network client (web browser) for text terminals on computers with Unix-like operating systems. It is written in C, fast, small, nicely configurable, and comfortable; e.g. the low-level network communications are performed in a non-blocking way, and you can keep open as many "virtual windows" as you want and work simultaneously in two of them in a split-screen mode"
Another very good command line browser is lynx. It will most likely ask if you want to allow cookies. To navigate the page use the arrow keys. Here is a short description of the most important ones. That is the most basic key navigation commands. You want a text browser or a command line method? This is command line, using telnet e.g. It doesn't support SSL, graphics, HTML5 etc and you might have to guess the index page if the server doesn't have a default file. But it is better than nothing and a very quick testing tool. Yes, you can use lynx. Lynx is a fully-featured World Wide Web (WWW) client for users running cursor-addressable, character-cell display devices (e.g., vt100 terminals, vt100 emulators running on Windows 95/NT or Macintoshes, or any other "curses-oriented" display). It will display hypertext markup language (HTML) documents containing links to files residing on the local system, as well as files residing on remote systems running Gopher, HTTP, FTP, WAIS, and NNTP servers. Current versions of Lynx run on Unix, VMS, Windows 95/NT, 386DOS and OS/2 EMX. You can use W3M for this purpose. They can handle basic features, and are ok if you want to set up your router via your home workstation by ssh, for example. Another program that might work for you is lynx. It is a terminal based web browser. How to read package description or man page without installing? Is Ubuntu Server 13.10 suitable for running a web server on older hardware? Upgrading from the command line? How to open file with default application from command line? How do I change the desktop background from command line? How to connect to internet through command-line? How to merge odt documents from the command line?